The initial encounter screen. This is mostly good. There is the lack of a plural on the monster name. (Yes, it was supposed to add an ‘s’ on the end.) And the position of the units isn’t correct; my party came from the left so they should be on the left and the monsters on the right. Hmm, it’s missing the “Your turn guy, this weapon ready” line. And the commands look a little squished. And his actual CHARACTER is gone from the map and the sprite “blink” effect looks corrupted. But at least it’s at a stage where the character can do something. This entry was posted in CRPG, Design, Screenshots, TI-99/4a. Bookmark the permalink. That’s a very clever way to implement that game mechanic. Given that you have tactical combat as opposed to “blobber portrait” combat, you have a cohesive game engine that allows for such. I had a Dungeon Master who would come up with these horrific life and death scenarios and he’d force his players to to extremely creative on how to get out of them. He wasn’t above killing off player characters, in fact he reveled in it at times. But those D&D sessions were the most fun. 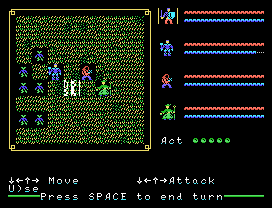 Realms I – programmed in a few weeks when I was a teenager. It plays like Telengard. Realms II – basically Telengard with a procedurally generated world map with dungeons. I later added some portraits (20 of them). Realms III – equivalent to Ultima I as far as a game world goes, 45 portraits and an adventuring party of 6. 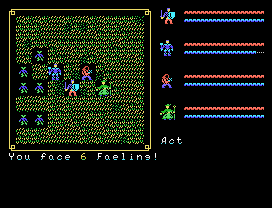 Realms IV – the equivalent of early Wizardry (I-III) with about 110 portrait graphics. In fact, I even put in black and white wireframe graphics for good measure. Party size of 8. Realms V – A game world that’s equivalent to Ultima III, cities with townspeople and with early Wizardry-like dungeons (along with the introduction of dialogue which I never bothered with before), 350 portrait graphics and the D&D-like system that I continue to improve and refine. Party size of 10 along with 10 additional slots for summons/controlled monsters/NPC allies. There’s a relatively modest process that I went through to get to where I am now. You’re setting your goals quite high from the start. Yes, I was definitely using Ultima V as my benchmark, given it’s the highest rated 8-bit CRPG of all time, plus it has great depth of character to the story and NPC’s. A good DM can make up for a hard game! The difference between tabletop games and CRPG’s though is that the latter won’t have the flexibility to offer alternative solutions or make on-the-fly changes to unexpected actions. Part of my lack of interest in a Wizardry/Might & Magic/Bard’s Tale kind of game is I didn’t really grow up playing them. Tunnels of Doom was 3D corridors but had 2D combat. The pretty pictures of Ultima games with top-down views of the map drew me in like nothing else.